When preparing to install the Facebook pixel onto your website, there are a few things to keep in mind. Facebook integrates well with many platforms. Let's start with the basics. Depending on which website platform you use, the directions may be different. To install the pixel to your website—no matter what kind of website it is—please have your Facebook Pixel Base Code and your Pixel ID ready as you read these instructions. Web.com emails you this information in a separate text (.txt) file. You must install the Pixel Base Code with the fbq (‘track’, 'ViewContent’); event code into the header of every page of your website. With the event code, you will receive data about all page views on your website to establish a baseline for measuring specific events. 1. Locate the header code for your website by finding the <head></head> tags in your webpage code or locating the header template in your Content Management System or web platform. 2. 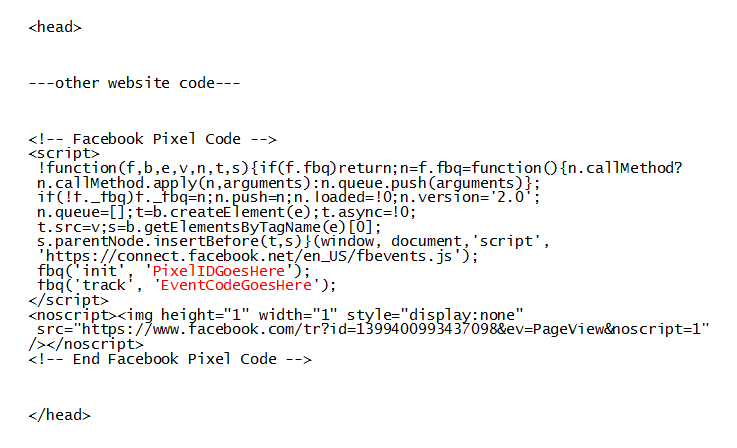 Copy and paste your entire Facebook Pixel Base Code into the website header just above the </head> tag. 3. Add this event code to the Contact Us page (in addition to the base code mentioned above). Let us know when you have completed steps 1-3. Then we can verify that the Facebook Pixel is installed correctly. 1. Locate the header code for your website. You must install the Pixel Base Code into the header code of every page of your website. This lets you get data about all page views on your website to establish a baseline for measuring specific events. Find the <head></head> tags in your webpage code or locate the header template in your Content Management System or web platform. 5. Add this event code to the Checkout page (in addition to the base code mentioned above). 6. Add this event code to the Order Confirmation page (in addition to the base code mentioned above). Let us know when you have completed steps 1-6. Then we can verify that the Facebook Pixel is installed correctly. If you have questions at any time or need additional assistance on completing the above tasks, please contact the Facebook Support team at 1-800-757-6861, Monday through Friday, 8 AM to 8 PM ET. Web.com—Additional Resources for Facebook Pixel Web.com—What is the Facebook Tracking Pixel?